For removal of bandages, tapes, dressings, wraps, ets. 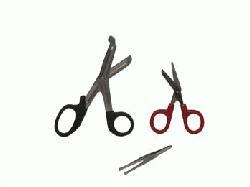 Scissors for cutting clothes, boots, leather or plastic and light metals. Designed for fast removal of foreign objects from the skin. Stainless Steel.